New Zealand will be forever in our minds. What a beautiful country, full of amazing locations, diversity of cultures and welcoming people. Our journey took a bit more than two months and we had the chance to see both the North and South islands, covering more than 6000 Kms. Alone, with your partner, with or without children, New Zealand is a must! For tourists traveling with children, I can't stress enough: New Zealand is the place to go. We went to New Zealand with our two children, 4 and 5 years old at the time, and it couldn't have been a better choice. You'll find playgrounds everywhere and museums with activities for children are also easy to find. What accomodation is concerned, we stayed in all kinds of places. From backpackers to 4 stars hotels, we experienced it all. The children prefered the backpackers though! Go figure. This website is a simple tribute to a country that gave us such a great experience. We hope you enjoy the pictures and videos in the different galleries. The visit to Fyffe View Ranch Adventure Park was a success. The children had lots of fun and enjoyed the horseback riding experience. The team at the Ranch was great making the children feel safe and showing them around. Thank you once again! More details at Fyffe View Ranch Adventure Park online. The South Island, with only 25% of New Zealand’s population, is much calmer than the North Island and you must drive considerable distances to reach Christchurch, Dunedin or Queenstown. The West coast is still very wild and you will drive many hours through dense rainforests and have the chance to see the power of the Tasman Sea as it pounds many beaches along the coast. On the East coast, you’ll be able to visit Dunedin, Christchurch and Kaikoura and do some whale watching. Don’t forget Arrow Town – a gold mine settlement – where you’ll learn how Chinese settled there during the Gold Rush in 1880’s. The North Island is the most populous of the two main Islands of New Zealand and three of New Zealand´s largest cities are located here. From Cape Reinga to Wellington, from the west to the east coast, you’ll see amazing beaches, lakes and bays, natural parks, volcanoes, geysers and cosmopolitan cities. 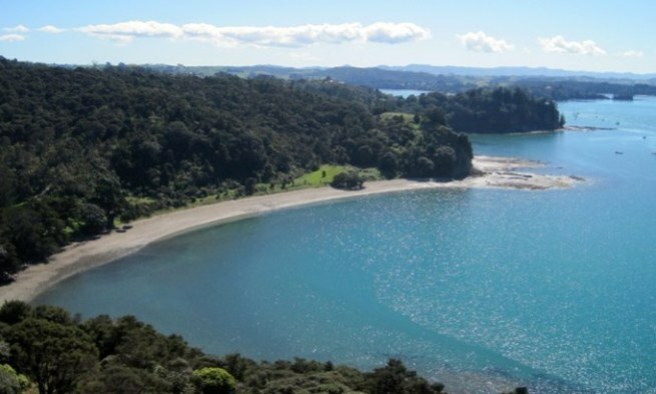 The Mahurangi Regional Park is simply amazing and definitely one of those places that you will not forget. After walking through the gate and following the pathway for about 200 meters, we reached the highest and very exclusive area with only one picknick table. There was no one there and we could enjoy pure nature beholding an amazing view over the bays and small islands.